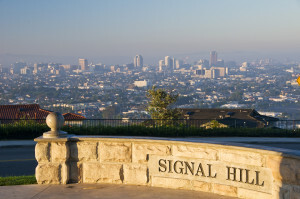 Signal Hill is a city (2.2 mi², 5.7 km²) atop a hill in California located in the Greater Los Angeles area. An enclave completely surrounded by the city of Long Beach, Signal Hill was incorporated on April 22, 1924, roughly three years after oil was discovered there. As of the 2010 census, the city population was 11,465. Signal Hill lies in the 562 area code. The city once shared three different postal ZIP codes with the city of Long Beach but in July 2002, the city of Signal Hill received its own ZIP code, 90755. The hill that the city is named after is 365 feet (110 m) above the surrounding town of Long Beach. Because of this height, it was used by the local Tongva Indians for signal fires that could be seen throughout the surrounding area and even out to Catalina Island, 26 miles (42 km) away. After the Spanish claimed Alta California (“Upper California,” or what is now the state of California), Signal Hill eventually became part of the first large rancho grant to be allotted under Spanish rule in Alta California. The Rancho San Pedro (Dominguez Rancho) land grant exceeded 74,000 acres (300 km2) as granted to a soldier, Juan Jose Dominguez, who accompanied Junipero Serra, by Governor Fages through authority of King Carlos III of Spain in 1784. Between 1913 and 1923 an early California movie studio, Balboa Amusement Producing Company (also known as Balboa Studios), was located in Long Beach and used 11 acres (45,000 m²) on Signal Hill for outdoor locations. Buster Keaton and Fatty Arbuckle were two of Balboa Studio actors who had films shot on Signal Hill. Before oil was discovered in Signal Hill, there were large homes built on the hill itself, and in the lower elevations was an agricultural area where fruits, vegetables, and flowers were grown.